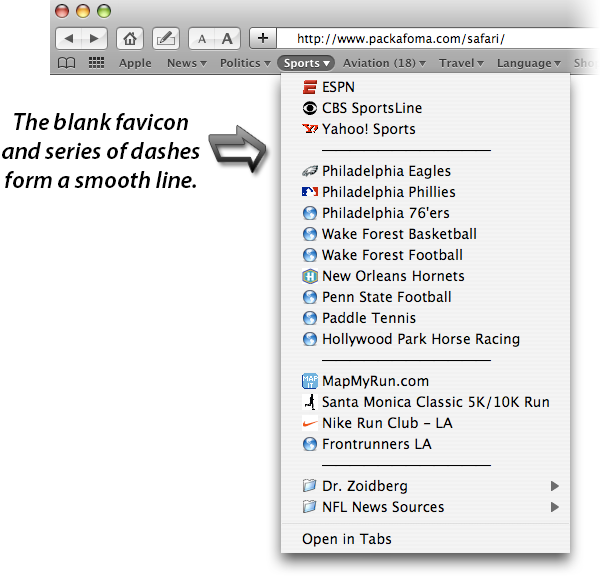 Apple Safari has been my favorite web browser since it was introduced along with Mac OS 10.2. Early on, however, I discovered a minor but irritating omission, which is that there was no way to add line separators to your lists of bookmarks, a feature common to most other browsers. Separators let you organize your bookmarks into sections or categories within your bookmarks menu or the folders of your bookmarks bar. I came up with a “temporary” fix at the time, but after countless updates, Apple still hasn’t added this basic feature. My solution was to create a page with a blank favicon and a series of dashes for the page title, which, when added as a bookmark, functions as a separator. I’ve had the page with the blank favicon up on my site in some form or another for a long time, but now that I have this nifty blog, I figured it was a good time to share it with those 5 or 6 other people who find this state of affairs as intolerable as I do.